I've been collecting maps for many years as I'm trying to get some from every country. I find map collecting is a great way to study geography. It's fascinating to look at maps and see all these countries with their borders, and thousands and thousands of kilometers of roads between the little dots which represent cities. This is how I have learned about countries like Azerbaijan, Turkmenistan, Moldova, Uzbekistan and many others. Azerbaijan recently issued stamps featuring the "Princess that captured people's hearts." Diana, Princess of Wales (UK), who died last summer (1997) in a tragic car crash in Paris. Shown above is one of the two series. 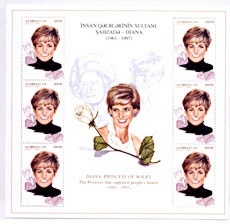 Both use the same central graphics - only the portraits on the stamps are different. Naturally, maps and geography are closely related to stamp collecting, which I also do. These interests all overlap. I am not interested in collecting ordinary stamps from countries like France and Germany. It's the lesser known countries that bring me more pleasure because their graphics are always more interesting. Most countries just throw some face on their stamps, but the little known countries are more creative. I've been having a hard time finding used stamps from Azerbaijan and wonder if you could send me some from the letters you receive? I realize this is an unusual request. I found you while browsing for Azerbaijan on the Internet and just thought I would write to see if I would have any luck in obtaining some. I'll be glad to pay for them.